Science has learned a lot about how the brain works during the past 50 years. For example, the physical brain, made up of brain matter, blood vessels, nerves, neurons, and so on, can be repaired, even rewired, and circuits regenerated. The brain is capable of creating new structures that can make it more effective—an awesome wonder indeed! The mind is our intellectual ability to use our physical brain. Yet, often the mind holds back the brain because it gets stuck in certain patterns that it likes to repeat over and over, repeating so often that the pattern becomes a structure or habit we cannot break. For example, you enter an elevator with Muzak playing one of those 70s songs from the Carpenters, like “I’m on the Top of the World” for a dozen bars, before you exit. The next thing you know that song is humming in your mind for the rest of the day. You didn’t choose to get hooked on that song; you just kind of fell into it with no conscious choice on your part. Your mind was exposed to what in music is called “the hook.” A hook is a musical phrase that is structured in such a way, that as it begins to end, it throws itself back to the beginning, and begins all over again. After hearing a dozen bars of “I’m on the Top of the World”, your mind is trying to resolve the unfinished bars, the ones you didn’t hear. That’s why you can’t get it out of your head, unless you consciously play the song, or sing the song, and finish it so that the tension is resolved, allowing your mind to move onto something else. Similarly, our minds can get stuck with a belief, or attitude, or habit related to our work. 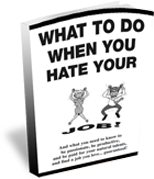 If you hate your job, and want to quit or change careers, your mind will focus on that tension. If a hook is constructed in your mind in the following manner: I hate my job but if I quit I will become poor, or lose my pension, or lose face with family and friends–then your mind will get stuck on that one track. The hook is a fear of negative consequences. Your mind plays that tune over and over in your mind and all you can hear are the negative consequences that might result from quitting your job. While your physical brain is ready, willing, and able to add new and better wiring, your mind wants to play the same old song: “I hate my job but I fear poverty.” This is the tape that plays over and over again in your mind. The key is to give your mind different material to focus on. It’s the only way to break the endless loop. Most people don’t realize that their mind works as a simple tension-resolution system. It’s always looking for a tension to resolve. That’s why we are susceptible to Muzak. Trapped in an elevator, most of us are exposed to the musical hook and we exit the elevator before our minds have time to resolve the tension. If you give our mind junk food to work with, then the outcome will be junk: the “garbage in, garbage out” feedback loop. The mind will work to resolve any tension that it considers. Be kind to your mind. Give it some stimulating tension to resolve. Whatever you focus on is what it will try to resolve. Instead of focusing on negative consequences that might happen if you quit or lost your job, which plays like an endless loop in your mind—trust the fact, that your brain is wired to find a new and better structure for you. Your brain is an awesome wonder. Give it good material to work with. Develop a vision of what you really want in terms of work. Then focus on that. Think about your current reality; not the negative stuff that is holding you back but the stuff you already have that supports you attaining your vision, such as relevant experience, training, contacts, collateral, and so on. In your mind, think of an elastic band and stretch it out. Now picture your current reality at one end of that elastic band, and the kind of work you want at the other end. Then let your mind do what it wants to do anyway, which is to resolve that tension. This is the beginning of a successful career transition. Of course, there are actions to take, strategies to employ, tactics to use, but now your mind is working with you instead of against you.